Plain and simple, it’s all about the shoes. Today was a day for a long run. I was supposed to run 5 miles. I was tired, cranky, and had a head cold so I was worried that I wouldn’t even complete one. But at the prodding of my super supportive husband I laced up anyway and got out the door. After the first mile my shins were hurting. Then came the knees. Then a weird pain in my foot that I hadn’t felt before. I couldn’t understand why I had all these weird pains when I was running significantly slower than normal in order to complete all 5 miles. Then it hit me. It is time to change the shoes. Even though I had another pair waiting at home for me, I felt a sadness creep into my run. I thought maybe it was just the weird pains, but in the end I knew that wasn’t it. This was going to be my last time running in these shoes. And suddenly, 5 miles didn’t seem like too much. It seemed like not enough. Before this attempt I had tried the running thing a few times before, each time in shoes that I bought from a department store or a random shoe store in the mall. I bought usually based on looks and what I thought the other “real” runners were wearing at the time…something that would make me look like a “real” runner even when I wasn’t. During Christmas break my best friend came home for a visit. She is a “real runner”, multiple miles and Ks, marathons, etc., and yet talked to me like I was one too, even though I was only up to 2 miles at a time, even though I hadn’t run in a month. She told me how running isn’t ever easy, even for her. She gets the same pains I do, the same tiredness, the same foreboding feeling of running certain days. She suggested I try it again, and maybe this time, head to Charm City Run, a local running store, to find the best shoes for me. I was always nervous to enter these stores because of the feeling of not being a “real runner” but everyone was so wonderful and personable and simply celebratory of everyone who is up and out there and doing something. After a few trials and a few runs on the treadmill, I finally settled on the Brooks Adrenaline GTS 14. I was skeptical because I had tried Brooks before but hated them. But from that very first run in my Brooks, on the first day of 2014, I felt like I had met my soulmate. I was back to barely running a mile, but my shoes didn’t care. They were there for me every step of the way, literally. Every time I put them on it felt like coming home again. While I had run before (and stopped quite a few times) these were the shoes that saw me through running in snow storms, completing my first 5K without stopping to walk, completing my first 6K, running in the Color Run as a family (the first race for both my boys and my husband), and 2 pants sizes. 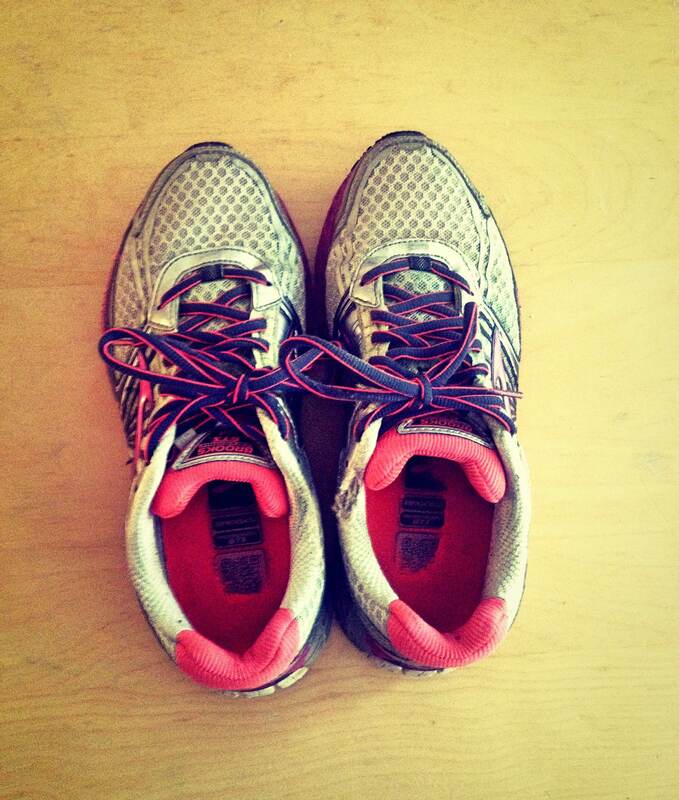 These are the shoes I was wearing when I signed up for my first half-marathon before I could chicken out. These are the first shoes that chose me instead of me choosing them. These are the first shoes I bought with my ultra running best friend who inspires me each and every day to get up and run. These are the shoes that got me back where I need to be. And while I know I have a new pair waiting in the closet, they will never be these shoes. The ones in the closet are worth $120. These ones are priceless and are literally filled with my blood sweat and tears. Today was a day for a long run. I was supposed to do 5 miles. But instead, to celebrate my shoes, I did 6.2. My first unofficial 10K. These shoes literally took me from .75 miles to 6.2 miles in four and a half months. But really it’s more than that. They took me farther than I ever thought possible. They took me to a place where I am a better version of myself…and that can’t be measured in miles.